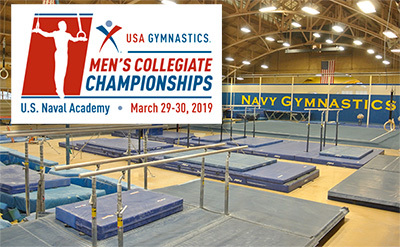 ANNAPOLIS., Md., March 28, 2018 – The U.S. Air Force Academy and Arizona State University are looking to successfully defend their Varsity and Collegiate Club Division team titles, respectively, at this year’s USA Gymnastics Men’s Collegiate National Championships at the U.S. Naval Academy in Annapolis, Md. Scheduled for March 29-30, the two-day championships will be held at the Academy’s Macdonough Hall. Three individual champions from the 2018 championships are returning to this year’s competition: Kiwan Watts of Richmond, Va./Arizona State University, collegiate all-around and vault; Peter Makey of Golden Valley, Minn./College of William & Mary, still rings; and Lukas Texeira of Waukesha, Wis./U.S. Air Force Academy, horizontal bar. The competition schedule is March 29 at 2:50 p.m. ET for the team and all-around competition, and March 30 at 1:50 p.m. ET for individual event finals. Five varsity and seven collegiate club teams are entered in this year’s championships. The Air Force is looking for its 10th-straight Varsity team crown, and Arizona State is seeking its 13th consecutive Collegiate Division title. The schools in the Varsity Division are the College of William and Mary, Springfield College, U.S. Air Force Academy, U.S. Military Academy and U.S. Naval Academy. The Collegiate Division includes Arizona State University, New York Alliance, Northern California United, Northern Illinois University, Southern California United, Temple University and University of Washington. Team and all-around competition will be conducted concurrently on the same day of the Championship weekend. The top eight (8) individuals in each event (plus ties) will compete for the individual Championships on the final day of the Championship weekend. There will be a maximum of two participants from each team eligible to qualify for finals on each individual event. Tickets are available onsite, and the prices are $10 per day or $15 for all sessions. Children 12 years-old and under enter for free. Spectators may park outside of the USNA grounds and enter the Academy through the visitors’ entrance located at Gate One at the corner of King George and Randall Streets (52 King George St.). Anyone under the age of 18, and who does not have a government-issued ID, must be accompanied by an adult. Vincent Colosimo, Las Vegas, Nev.
Kirk Malm, Colorado Springs, Colo.
Colton Palmer, Half Moon Bay, Calif.
Casey Cassara, Staten Island, N.Y.
Zachary Cipra, Downers Grove, Ill.
William Ryan, Santa Cruz, Calif.
Ryan Danis, San Jose, Calif.
Cameron Edwards-Rea, Santa Maria, Calif.
Ely Khatib, Redondo Beach, Calif.
William Pearce, Isla Vista, Calif.
Sharif Schulze-Allen, La Quinta, Calif.
Calvin Valrie, Buena Park, Calif.
Nicolino Dibattista, Plymouth Meeting, Pa.
William Heitland, St. Louis, Mo. Ben Bloom, Mill Valley, Calif.
Kyle Hendren, Battle Ground, Wash.
Perry Lightfoot, Huntington Beach, Calif.
Alexander May, Highlands Ranch, Colo.
Nathan Tsuji, Santa Cruz, Calif.
Ian Creelman, High Bridge, N.J.
Christian Gulotta, Lloyd Harbor, N.Y.
Peter Makey, Golden Valley, Minn.
Spencer Schrandt, Ann Arbor, Mich.
Christopher Iram, Bound Brook, N.J.
Trevor Lamberton, Willow Spring, N.C.
Sean Turtle, East Amherst, N.Y.
Christian Wilkey Jr, Lowell, Mass. Colin Hickey, St. Cloud, Fla.
Eric Klein, West Brookfield, Mass. Alex Schecchtman, Johns Creek Ga.
Allen Shadan, Orange County, Calif.
Frankie Valentin, E. Hartford, Conn.
Erik Del Cid, Manassas, Va.
Taka Giese, San Diego, Calif.
Elliott Herman, Los Gatos, Calif.
Darrel Yamamura, Elk Grove, Calif.
Liam O’Hara, Pearl River, N.Y.
Alexander Tombrink-Suarez, San Jose, Calif.
Nehemiah Baker, Oak Ridge, N.C.
Max Gerber, Dix Hills, N.Y.
Ben Provost, South Hadley, Mass. usagymcollegiatechamps.com is a USA Gymnastics production. To learn more about USA Gymnastics, visit usagym.org.